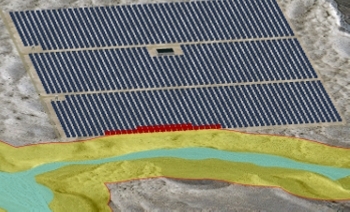 Renewable Energy Input Analysis| ECORP Consulting, Inc.
ECORP combines a full range of solar resource mapping, modeling and analysis services with an extensive knowledge of natural resource constraints, as well as an onsite comprehensive spatial data library, to provide unparalleled assistance with locating and designing renewable energy sites. Solar spatial analysis combines a GIS-based solar insolation model with regional elevation and vegetation data and known climatic conditions to estimate Global Horizontal Irradiance (GHI), Direct Normal Insolation (DNI), and hours of daylight for a designated study area. This becomes the foundation on which an Opportunity/Constraints analysis is prepared by adding information about existing utility infrastructure, visual resources, special status species habitat, cultural resources locations, and land use/ownership limitations. ECORP’s in-house spatial data library allows for the efficient and timely creation of Opportunity/Constraints analysis, providing knowledge of properties prior to and during land acquisition negotiations. The result is a constraints analysis prepared rapidly without the need for expensive site ground-truthing, but which provides enough data to assist in determining the suitability of a particular site for the needs of a solar project. Once a particular site has been acquired, ECORP’s team of scientists, permitting specialists and spatial analysis assist with identifying regulatory issues posed by a specific project location or layout. Upon identifying site constrains, ECORP can facilitate the regulatory permitting process by assisting team engineers in designing a project that will both meet the needs of the current regulatory environment and be cost efficient to construct and operate.